Make clean-ups a breeze with this smartly designed sweeper and dustpan that conveniently fit together for compact storage. Add a touch of rustic refinement to your countertop or table with a set of glass jars in a handcrafted acacia wood tray, perfect for serving salt, pepper and other seasonings. Clean, utilitarian design defines a sturdy steel-and-wood toolbox that perfectly balances form with function. A long-lasting kitchen towel that gets softer and more absorbent with every wash is woven from linen in a way that beautifully displays the natural fibers and is patterned in bold stripes for a classic look. Add an elegant touch to your table setting with a set of streamlined grinders featuring a rounded base and smooth rubberized surface for an easy grip as you grind salt, pepper, nuts, dried fruit and more. 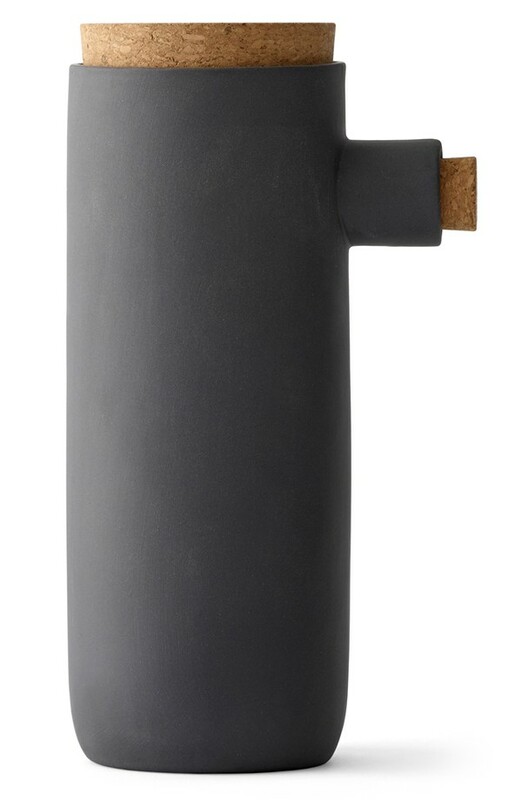 Smart European minimalism and functionality are the name of the game with this unique clay-crafted container created by Danish designer Murken Hansen. The striking vessel provides easy-access storage for rice, cereal, sugar and other dry goods, while the convenient spout streamlines the food and beverage preparation process and eliminates the need for an extra utensil. Made from heat-resistant glass, topped with a wooden lid and fitted with a silicone seal ring, this airtight canister offers clean, streamlined storage for kitchen staples from sugar to coffee beans. It stacks neatly with other Baum canisters and is safe for use in the dishwasher or microwave. Sized for snacking, this beautiful Japanese-style bento box is hand painted in soft color and secured with an airtight locking lid, making it perfect for packing fruits, salads and other tasty treats. A small-scale quilted oven mitt with a handy hanging loop is woven from pure linen with a technique that beautifully displays the natural fibers. Made of heat-resistant glass and sealed with an airtight cork, this elegant canister offers superb storage for dried goods like nuts, beans or loose tea. This sturdy, stocky steamer updates a time-honored Chinese technique, replacing the traditional bamboo base with adaptable, moisture-regulating terra cotta to create an ideal steaming environment. The pot and lid are made from fireproof ceramic that resists cracking, meaning you can use your steamer in the microwave, oven and on the stove-top with ease.